Miami-based Noven Pharmaceuticals’ uses automated proofreading with Braille measurement and reading. In the modern pharmaceutical landscape, organizations must navigate a global patchwork of regulations and standards in order get their product to market. Noven Pharmaceuticals, Inc. out of Miami tackles this challenge every day. A subsidiary of Hisamitsu in Tokyo, Japan, Noven manufactures and packages products to the American and European markets that includes prescription-only products, including those for women’s health (menopausal products), for attention deficit disorders, and for pain management. These products are sold to pharmacies, while other products are marketed and sold under a partnership. European requirements for Braille and medication guides printed in all the European Union languages create quite the compliance challenge. The difficulty is compounded by the need to deliver products in a timely fashion, while at the same time retaining a high degree of confidence in the accuracy of printed information on product leaflets, foils, cartons, and labels. In addition, Noven is reportedly one of the few companies doing business in the U.S. that ships products with Braille on the packaging. Braille is printed on packages for products shipped only to European countries, where it is a regulatory requirement for doing business there. In order to ensure that visually impaired individuals can read the embossed Braille dots, Noven’s Quality Control Department must be sure the points are sufficiently defined and that the content is correct. Although digital proofreading technology has been around for decades, recent advancements have improved the capability of such systems beyond simple comparison of A to B, to encompass all the attributes of packaging and other printed components of pharmaceutical products. To meet the growing regulatory challenge of international business in the 21st century, Noven chose Complete Inspection Systems Inc, (CIS), to provide a new digital proofreading system. The CIS equipment was installed, validated, and released for use in August 2013. The equipment installed included an AutoProof Pro with Image Compare software, Braille Verification System, and the Integra 9510 Barcode Verification System to both read and indicate that the barcode has been printed to ANSI standards. Only one system was installed—three components and two scanners, a wide-sheet scanner, and a flatbed scanner. With the CIS equipment, only one scan (taken with a wide-sheet scanner) is made of the sample film and inspection is done with the image compare system. A master sample is also scanned, or used from the library, in the same manner and both images are compared at once. 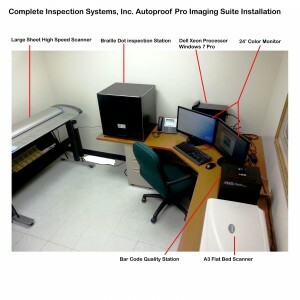 With one inspection, there’s one scanning, and quick results. Noven considered three vendors for the new system, and the items that were evaluated were for compliance to 21 CFR part 11, technical support, and price. Given the reality of rushed production schedules and compressed timelines, efficiency, quality control departments are more important than ever. Noven’s use of CIS’s AutoProof Pro Imaging Suite brings the process of print inspection into the main corporate IT framework. The system is directly connected to the corporate network, both on the front end in the task of retrieving archived approved digital artwork, and on the back end in storing records of document inspection and maintaining the audit trail and user access control that is part of the 21 CFR Part 11-compliant system. IT is also pleased. “The records of the quality control team can now be archived and backed up as part of our regular data maintenance process,” Rondon says. For any system to be put into production in a pharmaceutical environment it must first be validated. For a device that is going to be relied upon for guaranteeing print accuracy in a foreign language this is particularly important as the inspectors will have nothing in their real-life experience to compare the error against. The system must provide a definitive answer to the user as to whether the information matches or not. Noven uses the CIS systems mainly for transdermal products, but also for solid-dose products. Transdermal products are packaged in-house in Miami on several packing lines, where they’re produced and packaged from raw material to final product. Noven’s Janet Gonzalez says the company, “has benefited by the purchase of the CIS instruments by being able to expand its inspection of products, product types, and by complying with regulations as established by our regulators. Specifically, the previous inspection time was one hour whereas the CIS AutoProof Pro system inspection time (per sample) is 20 minutes. The CIS equipment does not affect the packaging line or process since Braille is not checked at the packaging stage but rather at the initial inspection of the incoming product before it reaches the production line. CIS equipment allows Noven to meet MRHA regulatory requirements for overseas shipments. Click HERE to view featured article. ⇐ Worlds Most Advanced 2D Barcode and Next Generation Secure Hologram.